At MANN’S FLORAL SHOPPE, Our setting is in the country overlooking the Illinois River. We have always said, "We are as close as your phone, but the drive is always worth the trip." MANN'S FLORAL SHOPPE is a professional local florist proudly serving Morris, Illinois and surrounding areas for over 35 years. Owner, Gloria Mann started the business as a greenhouse then added the floral shop two years later. The business has grown through the years to include a staff of seven designers. 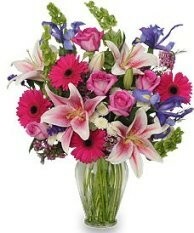 We are ready to assist you when you need flowers delivered locally or anywhere in the world. Our shop also offers daily delivery to local hospitals and funeral homes. Whatever the occasion, let us create a beautiful, eye-catching fresh or silk arrangement that’s customized just for you! We offer traditional and contemporary floral design styles that are appropriate for birthdays, anniversaries, get well, new baby, sympathy, holidays or just because. 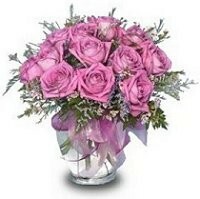 Send flowers with feeling from Mann's Floral Shoppe! WEDDING FLOWERS & SPECIAL EVENTS: Whether your wedding or party is formal or casual… a small gathering or the social event of the year… we can help you plan an event that’s a "blooming" success! We are #1 in our area and take great pride in our wedding work. Call us in advance at 815-357-8658 or 1-800-357-8658 to schedule your consultation. SYMPATHY & FUNERAL FLOWERS: Remember, you can always depend on us to help you choose funeral flowers for a friend or loved one. Let us create an arrangement that beautifully conveys your feelings of sympathy and serves as a lovely tribute to the deceased. We also create our own grave blankets, pillows and wreaths of fresh evergreens. LARGE VARIETY OF PLANTS & GIFTS: We also offer a vast array of gift ideas for any age or occasion, including made-to-order gift baskets, green plants, blooming plants, dish gardens hanging baskets & bedding plants (in the spring), plush stuffed animals, balloon bouquets, candy & chocolates, custom silk arrangements, baby gifts, home decor and more!